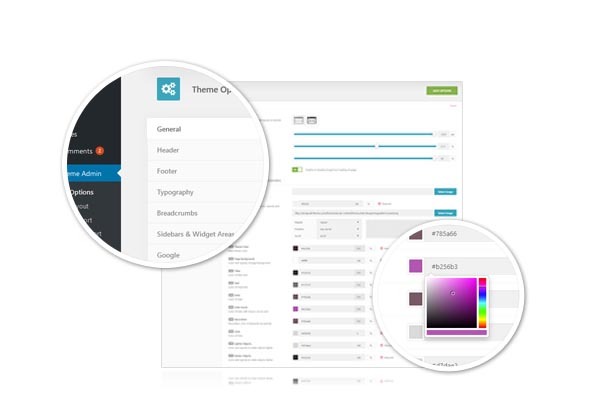 Extend your page builder with 30+ elements and many custom post types. All elements are unique from theme to theme and turn website building into dead simple thing. Individually created custom post types simplify content addition. Collection of adaptable elements ready to build any kind of website. Columns element makes it easy to organize content and other elements. Choose your column layout and fill it up with content. Add as many sidebars as you want. Your website can have one or unlimited sidebars. Right and Left sidebar is possible. Every detail of the theme can be customized from the ground. There are available basic layout and style options and on the top of these, every element on the page can have it’s own advanced settings. Element that helps you earn money from your site. Now you can easily manage your ads within theme. Columns element makes it easy to organize content and other elements. Choose your column layout and fill it up with content. 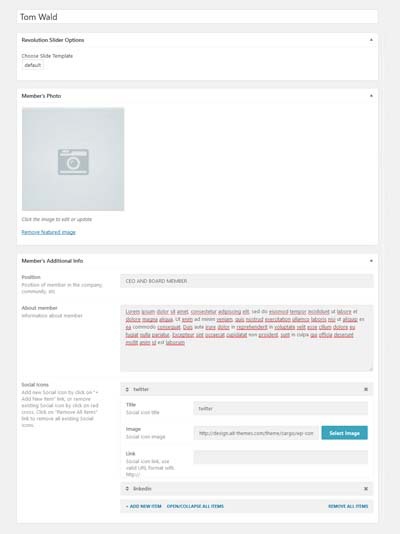 Standard WordPress comments can be moved up and down on the page using our Page Builder. You can also turn them off if you like. More user friendly way to set up any of the contact form you ever need. No hassles, just build your form inside page builder. Do you organize a conference, webinar, barcamp or any event? Just set up start and end date. Very impressive element. Build nice looking statistics in seconds. Counters can be added to any page and are available in three different styles. 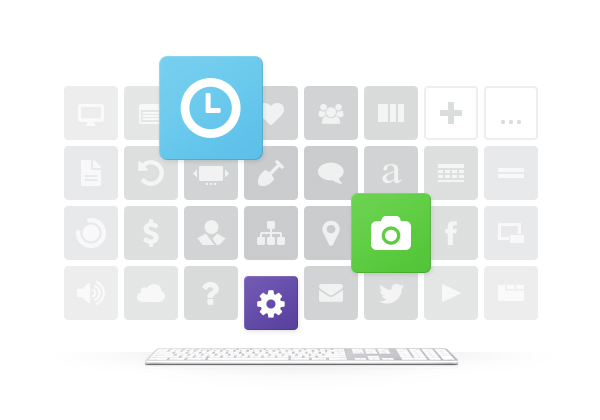 Create a slider in few clicks right from the page builder. You can also add slider into columns to present products or services. Simple event manager included. Use Wysiwyg editor to create rich content, location, date duration. Connect your WordPress website with free Facebook LikeBox or Comments Box. Easy way to display questions answers anywhere in on the page according to a category. Create custom maps with high quality markers containing locations, descriptions, images and links. Advanced layout color customization. Every company needs people. Adding job offers to your website cannot be easier. Special element developed for Sport Clubs and Leagues. Display match results anywhere on your website. Categorize members into teams and show them on any page. Use this element to share your DJ mixes over the internet for free using Mixcloud. A fantastic online streaming service. Simply set up opening hours of your office, select holidays and add additional text. 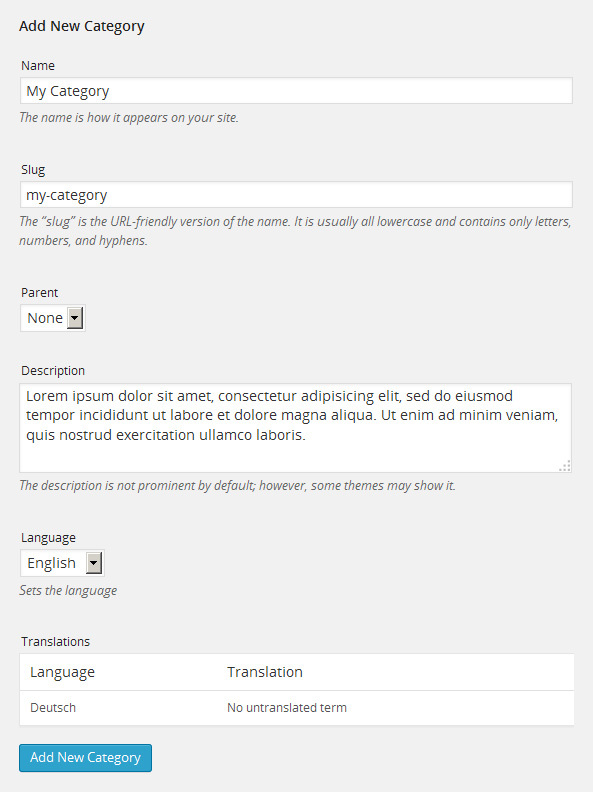 You can also control page title in our Page Builder. Some themes include features like custom background image. You can also turn it off. Here you can add logo’s, group them into categories and link to your partners, as many as you like. Show blog posts anywhere on any page. You can show them in list, grid, carousel. It's also possible to control image size and amount of text you'd like to show. Elegant way to present Prices on your website. Easy setup and looks awesome. Products element can be used to create Restaurant Daily Menu or Food&Drinks Menu. It can be also used to show price of your services and products. Multi-dimensional Responsive slider comes free of charge with all our themes. You already saved $18! Separate logical sections of your page with several different rule styles. Small touch will provide your presentation a professional look. Promote services, goods or display any info within boxes in a nice form. Quickly. 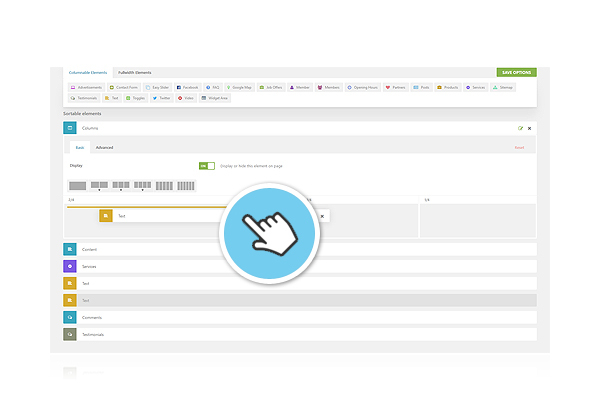 The easiest way to add a sitemap on one of your pages became reality thanks to this special AIT’s element. It allows you to easily embed content from various providers, you can use autoplay on page load with artwork displayed in the player. Allows you to add easily any reviews by your customers. You can group them into categories. Simple text element that can be used to create blocks of text, you can use it as full width element or in columns. You can copy & paste any embed codes as well. Display lot of content in a smart way. Visitors can click through it very quickly. Embed your twitter feed on your site. Anywhere. Select video source (youtube, vimeo), URL of displayed video and set up width and height of the player. You can create unlimited widget areas and use them anywhere on your website. Widget areas can be included into content. It's excellent for 3rd party plugins integration. Our WordPress themes include many Custom Post Types that will speed up website building process. No need to write your content over and over. Add your services using Custom Post Type and use it several times using Page Builder. You can create categories for all our Elements. It allows you to categorize them logically and then show only selected sets using Page Builder. You can for example display services from one category on one page and different on another. Custom post types allow you to write your content only once and then use it on several pages. Define your partners and then use it on any page. The same applies to all Elements on the left hand side. Hi, I’m trying to test if your theme will work for what I need it to achieve before purchasing. I’ve downloaded the free version, however nothing appears to be working without paying for a plugin? Is there any way of having a fully functional version of the theme so that I can explore if it’s going to work for me on my localhost? I cannot believe the elements plugin is no longer free! It is listed as free inside wordpress and the updater just removed it! That is so unfair. and that’s why clients have an option update from free to full version of the theme by purchasing the plugin. can you offer further more discount on full membership ? thanks for asking. We are sorry, we have no other discounts on the current price. Anyhow, please have a try to test a free theme version. The language switcher with the flag appears right after you start adding the content in desired language. thanks for purchasing our products. Your account is available at: https://system.ait-themes.club/admin/customers/detail/47237 , you should login where you can download any of our products. i´m using the foodguide theme incl. the element plugin. i´m trying to show single selected items with the items element on one page, but i can only select total categories or locations and no single or a couple of single items. is there any way so solve this problem, or a work around…? thanks for your message. Some of questions posted via our support forum – depending on the chosen category – are going to be answered by automat in order to minimise waiting time. Anyhow, you can still replay on such a comment and consequently you’ll get an answer from our support team as soon as possible. – did you activate the plugin AIT Toolkit after installation it? thanks for interesting i our products. Yes, it’s possible. Regarding Google Map Api Keys: Once your site has the less page views than for example 5K you shouldn’t exceed the free package of mentioned value you’ll get as a credit FOR FREE: https://cloud.google.com/maps-platform/pricing/sheet/ . Please have a look also at the 2nd point in FAQ at: https://cloud.google.com/maps-platform/user-guide/pricing-changes/ We do not plan to reintegrate the maps by the other provider for the moment. Thanks for understanding. I am wondering if https://www.ait-themes.club/wordpress-plugins/ait-elements-toolkit/ can be used for WooCommerce pages. The theme in use is LangWitch. Our customer would like to edit WC products using a PageBuilder. Currently, I am using Business Finder Theme the older version. Are you guys giving a FREE update to the newer Business Finder + Theme version? If yes then please guide me how I can upgrade. How does the Contact Form element work for members of the website? Will they have the option to enable a Contact Form element on their business page? Thank you. thanks for asking. We are sorry, there is no the section for item price. No one of our directory themes uses market place functionality. I want to download TOOLKIT WORDPRESS PLUGIN and AIT LANGUAGE and doesnt work. They put that I have to paid for them ? I have already paid the 119.79 $ Full Membership. So normaly I can download all the themes and plugins I want. So why is not working ? thanks for contacting us back. Could you please provide us of your user name registered in our account or feel free to post technical question directly in our dedicated support ticket system. Please login into your account at https://system.ait-themes.club/support/. I am using Event Guide theme and have purchased lifetime membership (purchased on 15 November 2018) with access to all of your themes and plugins. I have currently updated the AIT-Elements Toolkit to version 2.0.5 however, nothing was changed compared to the older version. I see all of your reviews of AIT Elements have much more functionalities compared with the elements that I have in my WordPress installation. Namely, I am missing: Testimonials, Matches, Jobs, Opening Hours, Services etc. all of these that are crucial for my project. Could you please help and advise on what might be the issue. Some additional custom post types and elements can be added by installing plugins. we don’t offer any additional services related to websites of themes users except the following ones: https://www.ait-themes.club/services/ . In general, support covers mainly finding of solutions for problems and helps to users to find the way how to use any of our products. And if there is a bug we’ll fix it as soon as possible. Unfortunately we are not capable working on user’s custom websites. I just updated the AIT Elements Toolkit and my site crashed. How can I use the older version until this gets straightened out? Do I need to renew my membership for this to work? I contact you because I have a 504 gateway Time-out on my website. I have desactivated the AIT Elements Toolkit and the error deasappear (but the website don’t work anymore). Everything is up to date so please let me know as possible the right move. Please provide our Ait-Themes team with AIT SysInfo report: https://www.ait-themes.club/wordpress-plugins/ait-sysinfo/. Our technicians are ready to help you with any theme-regarding issue: Customer Support is provided during working days from 8am to 5pm Central European Time. If you have not created Ait Themes Club account yet, please use this form: https://system.ait-themes.club/join/tf and post your technical question directly in our support ticket system. Please log in to your account https://system.ait-themes.club/support/ . In general support covers mainly finding of solutions for problems in theme and help users use the product, if there is a bug we’ll fix it as soon as possible. Unfortunately we are not capable working on user’s custom websites. I bought a membership a few years ago and tried to install the directory + theme and had difficulty with the maps showing in listings and shortcakes did not work and a few other things. Since then, I had been involved in another project that took me away from this project. I am not sure whether i have understood you correctly regarding shortcakes, anyhow, please have a look at the demo preview site where you can check out the functionality of the demo page. There is no issue, and once there is a bug our team will fix it as soon as possible. Text editor doesn’t seem to be loading even though I have the latest version of this plugin is that because I didn’t purchase it through here and got it with the theme forest license? I looked at the code and found it has a textarea with the html that was set as display none. I have now overidden that with css so I can at least edit in html but unsure why the actual text editor isn’t working anymore in the pagebuilder. thanks for contacting us back. There is no any difference in version whether you purchase the product on theme forest or via our club. Anyhow, please provide our Ait-Themes team with AIT SysInfo report: https://www.ait-themes.club/wordpress-plugins/ait-sysinfo/. Our technicians are ready to help you with any theme-regarding issue: Customer Support is provided during working days from 8am to 5pm Central European Time. If you have not created Ait Themes Club account yet, please use this form: https://system.ait-themes.club/join/tf and post your technical question directly in our support ticket system. Please log in to your account https://system.ait-themes.club/support/ . In general support covers mainly finding of solutions for problems in theme and help users use the product, if there is a bug we’ll fix it as soon as possible. Unfortunately we are not capable working on user’s custom websites. Resolved the issue it was due to not updating revslider once that updated the text editor started working correctly again. Hi, Im interested on buying this Event Guide theme, but I have few questions before I proceed. Can users upload their events here? I am using the AIT elements toolkit in wordpress. Since I updated to version 2.0.6 it doesnt work. The plugin causes a screen of death, error 500. But when i deactivate it, all the body content is gone..